NASA's Kepler space observatory has found more than 1,200 potential alien worlds since it began hunting for extrasolar planets in 2009. Observations from the mission's first four months alone have unlocked a flood of exoplanet possibilities, including 54 candidates for habitable worlds orbiting distant stars. Today (Feb. 2) NASA unveiled the latest set of observations from that four-month period. NASA officials expect the $600 million Kepler observatory to continue staring at its target patch of sky until at least November 2012. $600 million: The cost of the Kepler planet-hunting mission at its launch in March 2009. 156,000: The number of stars in the constellations Lyra and Cygnus that the Kepler observatory is staring at 24 hours a day, seven days a week, in the search for extrasolar planets. Kepler's field of views covers about 1/400th of the sky. 1,235: The number of potential alien planets that Kepler has discovered. 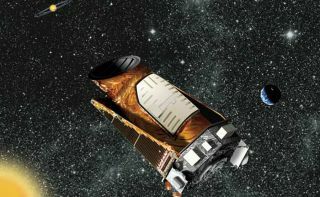 NASA has repeatedly cautioned that all of Kepler's findings must be confirmed by follow-up observations using other space and ground telescopes. 662: The number of planet candidates found by Kepler that would be about the size of Neptune. Neptune has a radius of about 15,388 miles (24,764 km) wide and has a mass that is 17 times that of the Earth, according to NASA. 288: The number of exoplanet candidates discovered by Kepler that are in the super-Earth class. Super-Earths are planets with masses between two and 10 times the mass of Earth, according to NASA. 170: The number of stars that seem to have more than one planetary candidate orbiting them – which would make them parts of alien solar systems. 165: The number of potential planets found to be the size of Jupiter, which is the largest planet in our solar system. Jupiter has a radius of about 44,423 miles (71,492 km) and has a mass that is 318 times that of the Earth. 68: The number of Earth-size planet candidates in the Kepler data release. 54: The number of the planet candidates that appear to be in the "habitable zone" around their parent stars. The habitable zone is a belt just far enough from the star for any orbiting planet to be able to have liquid water on its surface. Of the 54 potentially habitable planets found by Kepler, only five are about the size of Earth, NASA officials said. The other 49 have sizes that range between the classes of super-Earths (twice the size of Earth) and jumbo Jupiters. 19: The number of potential alien planets larger than Jupiter. 15: The number of planets discovered by Kepler that have been confirmed to exist by follow-up observations by astronomers using other instruments. 4: The number of months Kepler spent searching for extrasolar planets for the data set used to compile the statistics above. The space telescope was gazing at the same patch of sky from May 12, 2009 to Sept. 17 of that same year. 1: The number of Earth-size and Earthlike habitable planets confirmed to exist with intelligent life. We call this planet Earth.